This article is about the Australian musician. For the British musician, see Scott Matthews. For the American producer, musician and composer, see Scott Mathews. Scott William Matthew is a singer-songwriter born in Queensland, Australia. He was a member of alternative pop band Elva Snow (2001–2006), which he co-founded with Spencer Cobrin. On 7 March 2008 he issued his solo debut eponymous album. His second album, There Is an Ocean That Divides, appeared on 24 April 2009. On 10 June 2011, Matthew followed with his third album, Gallantry's Favorite Son. He resides and performs as an independent artist in New York City. Scott William Matthew was born in Queensland. He worked in various Brisbane punk rock groups, before relocating to Sydney where he formed Nicotine. He moved to New York City in 1997. 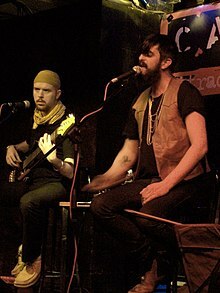 Matthew was a member of the alternative pop band Elva Snow (2001–2006), which he co-founded with ex-Morrissey backing band member Spencer Cobrin. Two songs from their self-titled debut album, which had Matthew on vocals and Cobrin on drums, piano, guitar and composition, were included in feature film soundtracks. "Hold Me" was in 2004's The Last Run, directed by Jonathan Segal and starring Fred Savage, and "Could Ya" appeared in the 2005 film Splinter, directed by Kai Maurer. After the dissolution of Elva Snow, Matthew performed with the band, Songs to Drink and Drive By, under the free-base mp3 label Comfort Stand. The group includes Matthew and Peter Gingerich on vocals with Marisol Limon on electronic organ, Nate Calkins on drums and Pablo Mitas on viola. Matthew wrote the lyrics to "Go Where No One's Gone Before", the main theme for the anime series L/R: Licensed by Royalty which was performed by Billy Preston. Matthew also contributed to the original soundtrack of John Cameron Mitchell's dark sexual comedy Shortbus (2006), which includes five of his tracks, "Upside Down", "Surgery", "Language", "Little Bird" and "In the End (Acoustic)". On 7 March 2008 he issued his debut solo album, Scott Matthew, on Glitterhouse Records. Allmusic's reviewer, Pemberton Roach, described Matthew's "quivering, otherworldly" singing and his "gentle, melancholic" songwriting with the album displaying his "enigmatic voice and tales of existential woe gently supported by a bed of tinkling piano ('Surgery'), softly plucked ukulele ('Little Bird'), vibes ('Amputee'), and muted horns ('In the End')". His second album, There Is an Ocean That Divides, appeared on 24 April 2009. Contactmusic's reviewer found "the minor guitar chords and sad sounding piano, along with Matthew's gloomy vocals set a melancholic tone". On 10 June 2011 his third album, Gallantry's Favorite Son, was issued. Franziska Meissner of Farrel Magazine extolled Matthew's release as it "delivers once well-known: Incredibly soft and incredibly haunting melodies simultaneously". Aside from being a singer-songwriter, Matthew also plays the ukulele and guitar. 2013 "I Wanna Dance With Somebody"
^ "Featured Artists: Scott Matthew". Glitterhouse Records. Archived from the original on 22 July 2010. Retrieved 17 September 2012. ^ "Scott Matthew – 'The Wonder of Falling in Love'". AirIt. Australian Music Radio Airplay Project. 10 July 2011. Retrieved 17 September 2012. ^ a b c Reges, Margaret. "Scott Matthew". Allmusic. Rovi Corporation. Retrieved 16 September 2012. ^ a b "Artists – Songs to Drink and Drive By". Comfort Stand Recordings. Retrieved 17 September 2012. ^ a b Roach, Pemberton. "Scott Matthew – Scott Matthew". Allmusic. Rovi Corporation. Retrieved 17 September 2012. ^ "Scott Matthew | There Is an Ocean That Divides". Contactmusic. Retrieved 17 September 2012. ^ Meissner, Franziska (9 June 2011). "Scott Matthew - Gallantry's Favorite Son". Farrel Magazine (in German). Pascal Biermann, Tobias Geiser. Archived from the original on 23 January 2013. Retrieved 17 September 2012. liefert Altbekanntes: Wahnsinnig leise und wahnsinnig eindringliche Melodien zugleich in English: delivers once well-known: Incredibly soft and incredibly haunting melodies simultaneously Note: Google Translate version here. Retrieved 17 September 2012. ^ "Scott Matthew – Scott Matthews > Credits". Allmusic. Rovi Corporation. Retrieved 17 September 2012. This page was last edited on 31 January 2019, at 08:04 (UTC).